Are you losing revenue thanks to the rise of ad blocking software? 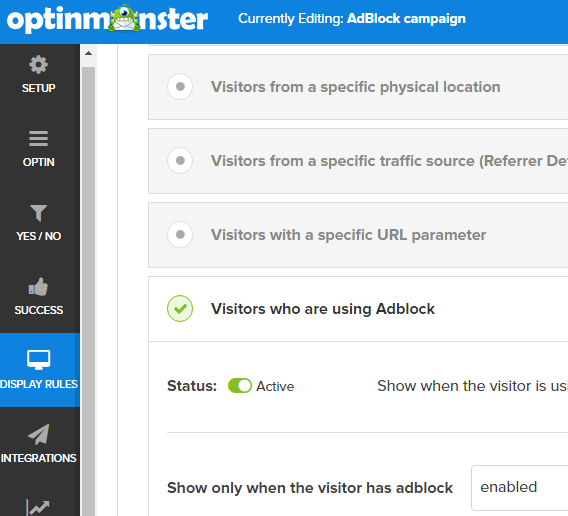 With OptinMonster, you can request users to whitelist your site by creating an optin targeting ad block users only. In this post, we’ll show you exactly how to use this feature to bypass ad blockers, including some effective examples from around the web. Ad blocking software is designed to block annoying popups, advertisements, malware, and more. Ad blocking can be a big threat for you if advertising is the primary monetization strategy of your website. Did you know that many of your visitors would be willing to turn off ad blocking on your site if you just ask them? In a survey conducted among the ad block users, 77% agree that they would prefer to ad filter rather than completely block all ads. If you rely heavily on your advertising income and want to unlock that lost ad revenue, you can ask your visitors to turn off ad blocking specifically for your site. Many visitors that love your content would be happy to help support your site. 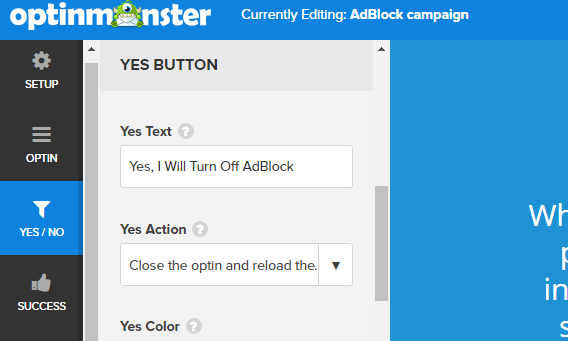 Let’s take a look at how to use OptinMonster’s ad block targeting to show a message asking your visitors to whitelist your site. First off, create a new optin by logging in to your OptinMonster dashboard. For the best result, you may either choose lightbox or fullscreen as your optin type. These optin types make sure that your message will be seen by your visitors who use AdBlock, Adblock Plus, uBlock Origin, and other popular ad blocking software. For the sake of this example, we’ll be using the fullscreen type and entrance optin template. Unlike most other optins, we don’t have to ask for visitors’ email in this optin because the purpose is to request visitors to turn off ad blocking on your site. You can replace the email optin field with a Yes/No optin button. 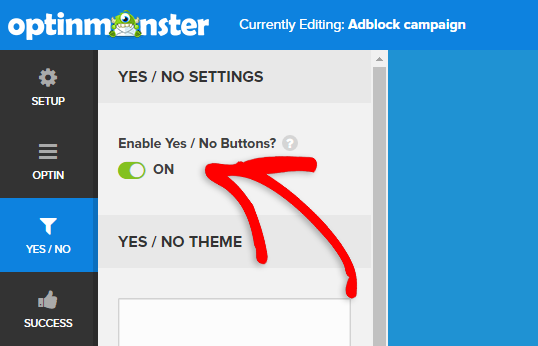 To do this, select the Yes/No tab in your optin builder and enable the Yes/No option. Then, scroll down the Yes/No Settings to see the Yes Button section. Now you can customize the yes button including its text and action. Let’s change the Yes text to Yes, I will turn off AdBlock. Now you’ll need to choose Yes Action. This option determines what action should be taken once the visitor submits the button. You can select Close the optin and reload the page. This means that the page will be refreshed every time a visitor clicks on this button. 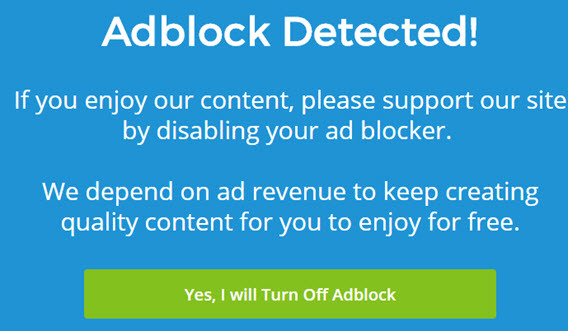 However, if the ad blocker is still not disabled after refreshing the page, your visitor will see the same optin asking them to turn off AdBlock. The optin will disappear once your visitor disabled their ad blocker on your site. If you want to force your visitors to disable AdBlock, you can turn Display No Button off. The next step is to edit the copy in the optin box you just created. You can politely explain to your visitors who use an ad blocker that displaying ads in your site helps you to produce content on a regular basis free of charge. Then, you can ask them to whitelist your website in their ad blocking software. Take a look at an example below. You can use the optin builder’s powerful display rules engine to ensure that the optin is displayed only to the visitors who use ad blocking software. To do this, click display rules tab in your optin builder, select Visitors who are using an ad blocker and turn the status to Active. After turning the status to active, you’ll see a sub-section Show only when the visitor has Adblock. Select enabled. Then, click Save on the top right corner of your optin builder. 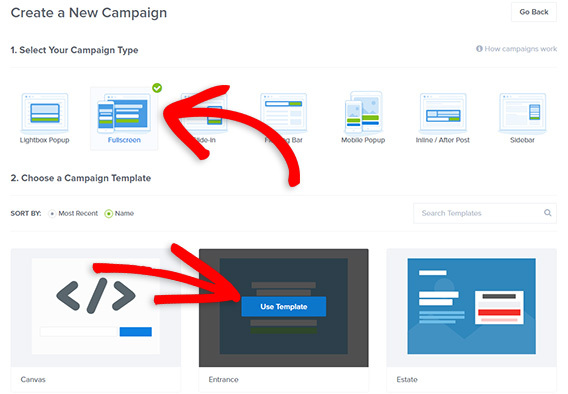 If this is your first time using OptinMonster, you can see our guides on how to add your campaign to your website. 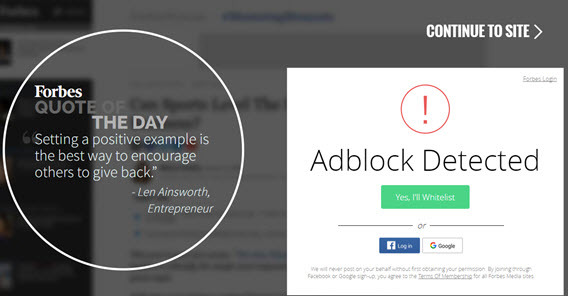 If you’re looking for inspirations to create an ad block detection campaign on your site, below are a few that might help. 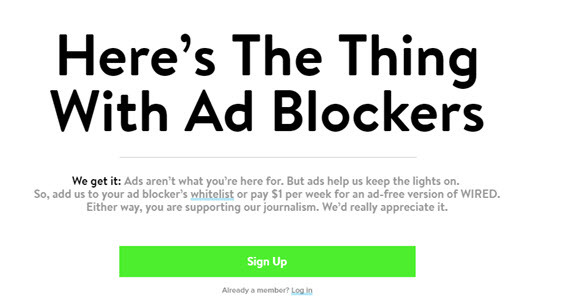 In the ad block detection campaign, Wired forces users to either whitelist them on ad blocker or sign up to their ad-free version of the site by paying less than $1 per week. They also link out to an article which explains to readers how to whitelist Wired on the ad blocker. Promoting an ad-free version of your site can be a great strategy to unlock lost ad revenue especially if a big chunk of your visitors are using ad blockers. It’s also a great idea to provide instructions to your users who may not know how to whitelist a site. Unlike Wired, Forbes does not want to charge readers to use the ad-free version of their site. Rather, they entice users to create a free account on the site, so users can browse through the ad-free version. They also did an excellent job on explaining how to whitelist the site on AdBlock. When users hover over the Yes, I’ll Whitelist button, a gif image will be shown explaining how to whitelist their site. 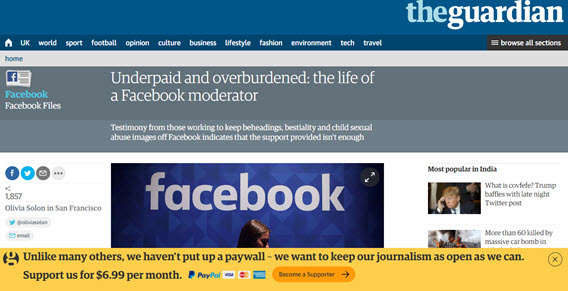 The Guardian uses a non-intrusive ad block detection campaign on their site. They don’t force users to either whitelist their site on ad blocker or sign up to their ad-free version of the site. Instead, with an easily dismissible floating bar, they encourage visitors to support them by paying $6.99 per month, so users can continue browsing through the ad-free site. If you’re monetizing your site with too many ads that your visitor may find intrusive, you’ll need to be selective when it comes to displaying ads. Or else, chances are your ad block optin campaign will be less effective, unless you’re not promoting an ad-free version of your site. Asking your first-time visitors to whitelist your domain may turn them off, since they don’t know yet whether your content is worth supporting. Instead, you can show the optin only to the visitors who have viewed a certain amount of page on your site. You can A/B test different variations of your ad block campaigns. For example, you can test which one resonates best with your audience: campaign with a no button vs. campaign without a no button. That’s it! We hope this guide helps you to get some insights on creating optins targeting ad block software users. If you enjoyed this guide, take a look at our article on 4 best practices for A/B testing your website forms. Shahzad Saeed is a writer specializing in conversion optimization and ecommerce. Besides OptinMonster, he regularly contributes to various Awesome Motive sites including MonsterInsights.com, WPForms.com, and IsItWP.com.